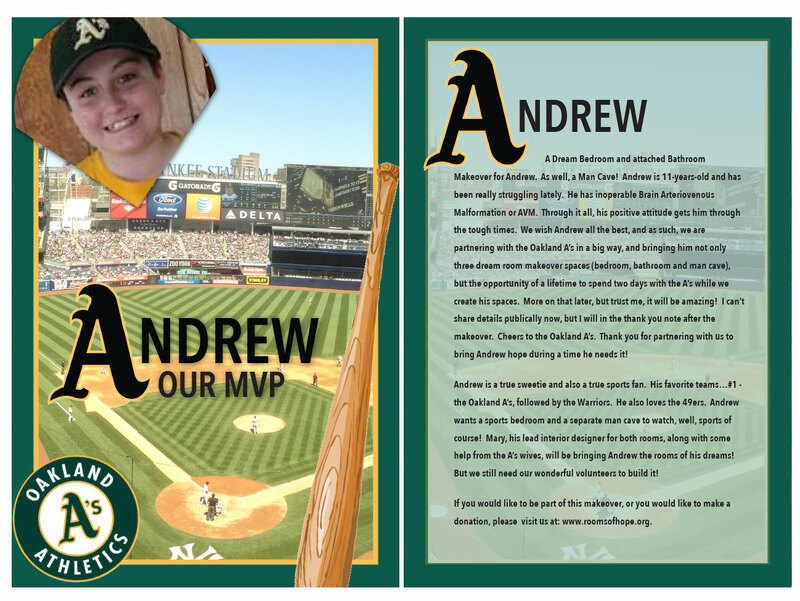 Andrew is such a special kid, and our Rooms of Hope family, along with the A’s organization, brought their A game to make sure he knew it! To our entire Rooms of Hope family, you did “good”!!! Your continued love of our children is nothing less than outstanding! To Melissa, my counterpart at the A’s, thank you for spearheading this makeover with me. The A’s organization is a mighty group of caring people who focused their attention on one thing…showing up in a big way and making one seriously ill child (and your biggest fan) happy! Lastly, thank you to the Butler family…your love of a child in need and sponsoring this room with your generous donation is life-changing! Cheers to Andrew and all that is good in the world!